Found at SheLoves Book Club! I've had the privilege of writing a couple of times over at , one of my favorite online spots, a space packed full of gifted women and rich writing. And I'm thrilled that SheLoves has chosen as its Red Couch Book Club book for the month of March! 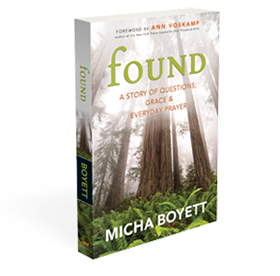 If you haven't yet read Found or , now is the perfect moment to read it alongside of community of other readers, and join in discussions on Facebook and at SheLoves. I love that they've decided to read Found during Lent, because so much of the book centers around following the church calendar and making new liturgies in our ordinary lives. If you want to read more, here's a link to over at SheLoves Magazine. Take a peek!